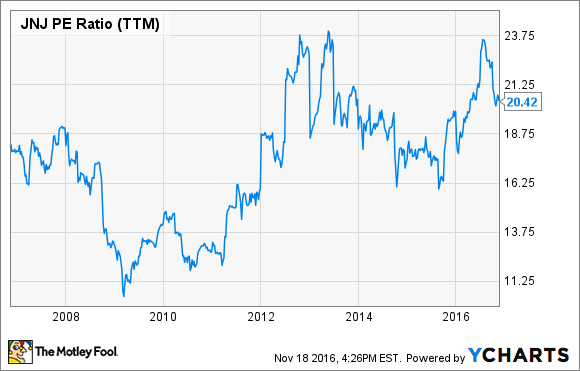 Buy and hold Johnson & Johnson stock forever? Here's why there are better choices available. Johnson & Johnson (NYSE:JNJ) has arguably been one of the best stocks to own for years. The company claims multiple successful brands, from Aveeno to Zytiga. But as much as I like J&J, investors might want to consider selling the stock. Here are three irrefutable reasons why. Johnson & Johnson grew revenue in the first nine months of 2016 by a relatively anemic 2.9% compared to the prior-year period. Net earnings increased during the same period increased by 4.4% year over year. Those aren't impressive numbers if you're looking for growth. Of course, J&J has several drivers of future growth. Cancer drug Imbruvica stands out as does anti-inflammatory drug Stelara. The company also has a strong pipeline featuring around 30 late-stage clinical studies. Johnson & Johnson expects to file for regulatory approval for 10 of those programs by the end of 2019. With all of that great news, why does Wall Street expect J&J to achieve annual sales growth of only 6.5% or so over the next five years? Although the company's pharmaceuticals segment is performing well, its consumer and medical devices segments aren't. Sales for those two segments combined are bigger than J&J's pharmaceuticals sales. The indisputable reality is that there are better growth stocks than Johnson & Johnson. Celgene (NASDAQ:CELG), for example, expects to achieve annual earnings growth of a whopping 23% over the next few years. Unlike Johnson & Johnson, Celgene isn't weighed down by lackluster business segments. Strong sales momentum for blood cancer drug Revlimid and anti-inflammatory drug Otezla combined with a solid pipeline makes Celgene a hands-down better growth pick than J&J. It's hard to find anything not to like about Johnson & Johnson's dividend. The dividend yield of 2.75% is pretty nice. J&J has increased its dividend for 54 years in a row. That's a track record few can claim. However, if you don't think Johnson & Johnson's dividend can be beaten, think again. It's not hard at all to find stocks with higher dividend yields. You don't even have to go outside of the healthcare industry to find them. Medical Properties Trust (NYSE:MPW) claims a dividend yield of 7.44% -- well over double that of J&J. The company has a stable business model leasing buildings to hospitals. Its primary customers are large hospital operators with long-term lease agreements. What about commitment to paying dividends? Because Medical Properties Trust is a real estate investment trust (REIT), the company is legally obligated to returning at least 90% of its net income to shareholders in the form of dividends. Medical Properties Trust doesn't have the history of increasing its dividends like J&J does. However, it would take years for J&J to catch up based on its historical dividend hikes -- and that's assuming Medical Properties Trust doesn't increase its dividend. There is another reason investors might like a stock: its value. So is Johnson & Johnson a great bargain right now? Take a look at its recent price-to-earnings multiple history. JNJ P/E ratio (TTM) data by YCharts. It's hard to argue that J&J's stock is cheap relative to its past valuations. Beyond that, though, there are other stocks with more attractive valuations and better growth opportunities. Biogen (NASDAQ:BIIB) appears less expensive than Johnson & Johnson on every front. The biotech's trailing-12-month earnings multiple and forward earnings multiple are both well below J&J's. Wall Street analysts think Biogen will grow earnings at nearly 9% annually over the next few years -- again, well above expectations for J&J. If you want value, it's undeniable that there are better value opportunities to be found than Johnson & Johnson. Don't get me wrong. I like Johnson & Johnson. The stock will likely provide very good returns over a long period of time. It has in the past. I've said before that my great-grandparents bought J&J products and my great-grandchildren probably will also. Can you get better returns, though? I think so. Over the last five years, Biogen and Celgene trounced Johnson & Johnson. Medical Properties Trust didn't, but its total return including dividends wasn't too far below J&J (and it outperformed for much of the period). Johnson & Johnson is a good stock. But as Jim Collins wrote in his classic book Good to Great, "Good is the enemy of great." If you want great performance, there are better choices.